I am pretty sure that Jones was not involved with the live version at the Moore Theater (which was recorded in spring 1995). Jones produced the version from August 1994 at the Backstage Theater in Ballard, Washington. Unfortunately, no video has surfaced from the "Road Home" album, which was recorded at the Backstage Theater in 1994 (with Jones producing and playing multiple instruments). The "Road Home" live DVD was recorded several months later, without any direct involvement from JPJ (although they re-used some of his string arrangements). I enjoyed the House of Blues show in Anaheim, California a few years back. Speaking of Red Byrd, there's some informations posted today by tenor John Potter on his blog: a new album featuring John Paul Jones' Amores Lejanos will see the light of day in 2013. (...) the John Paul Jones pieces will get a new lease of life (with the composer’s blessing) in versions for Anna Maria Friman and me, with Ariel Abramovich and Jacob Heringman on lutes. Anna will also play the lirone part on her hardanger fiddle. They’ll be in our Amores Pasados programme available next year, and we hope to record them on the same album as the new material we have by Sting and Tony Banks. The Led Zeppelin bassist wrote the original set of three Spanish songs for Red Byrd back in 1987, and with John Paul’s blessing we’re creating a version for two voices and two vihuelas (with Anna Maria Friman doubling on Hardanger fiddle ). These are exquisitely lyrical pieces and don’t sound remotely like Zeppelin numbers (to the bewilderment of some JPP fans (sic) who turned up to the first performance in Bremen). 11.13.94 Philadelphia, PA USA University of Pennsylvania - Irvine Auditorium. JPJ did an amazing encore of 'Communication Breakdown' with a flamenco twist. I managed to meet him after the show too! 10.17.99 Philadelphia, PA USA Theater of Living Arts-My friend was the taper of this show. At one point,someone yelled out "This is tomorrow tomorrow tomorrow" to which JPJ replied "That was yesterday yesterday yesterday"
03.14.00 New Orleans, LA USA House of Blues. He appeared on 'Rockline' in Feb 2002 where I asked him if he planned to release any live video and/or audio from the 'Zooma' tour. He said he did plan on doing so. But that hasn't come to be,unfortunately. Great find, Sam; it seems the correct performance date is December 12, 1973. 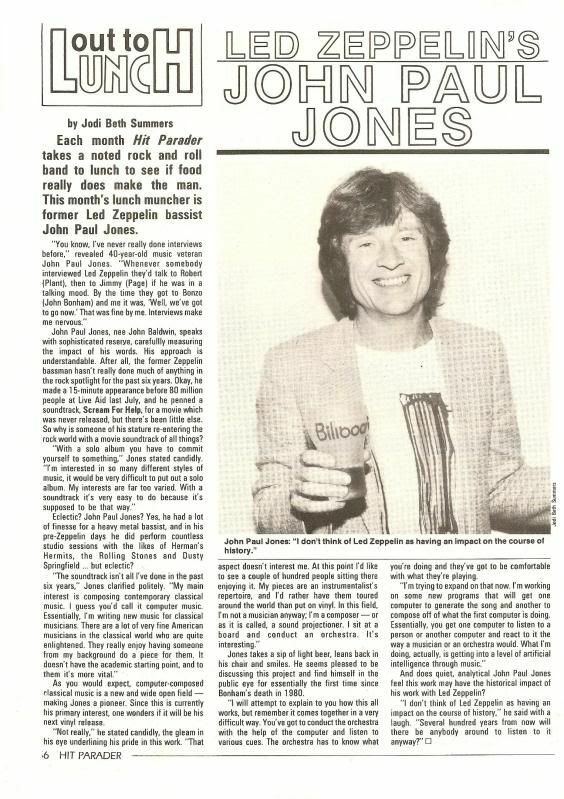 Yes, I show on Feb 27, 2002 Jones was the special guest on 'Rockline' a live nationally-syndicated radio program hosted by Marc "The Cope" Coppola and broadcast from Q 104.3 FM Radio in New York starting at 11:30pm. With regard to Zooma tour recordings, I filmed his fifth solo gig (Oct 8, 1999 at the Crossing Border Festival in Den Haag) from the front row and have released it to a select few enthusiasts. I can also confirm there was a professional video camera mounted to the soundboard during the Frankfurt gig (Nov 8, 1999). I've not seen that show in circulation. Three nearly complete songs from New Orleans (Mar 14, 2000) were simulcast on the Internet at www.rockuniverse.com/johnpauljones/live and have since surfaced on his official website as well as You Tube. I have seven Zooma tour performances (audio) archived and each is near soundboard quality. I would love to listen to this. I met John Paul Jones (at the hotel he was staying at in Toronto, just after his April 1, 2000 concert) and after a nice 20 minute discussion with him and his road manager and my friend in the hotel lobby (I thanked him for In Through The Outdoor - which he said no one really has said that to him before and never asked him about Robert and Jimmy, which again he thanked me for) he kindly signed two autographs for me and my friend and said that he had to cut it short (as it was between 2 AM and 3 AM I believe) as he was off to Montreal for the last date of his tour (tomorrow). So, the while I am not an expert in the John Paul Jones Solo Gig-ography, it would make more sense that since it is listed that he did a television taping in Toronto a day or two earlier that he would stay in Toronto, do the Toronto gig (at The Guverment) and then drive (he was using a tour bus) to Montreal (that drive is about 5 hours on average from Toronto to Montreal) instead of it being Toronto, Montreal, Toronto?